Back in January New Found Glory started releasing cryptic messages teasing new music and before we knew it they unleashed the pop-punk anthem ‘Happy Being Miserable’ a song which is full of bounce with a damn right infectious chorus and to coincide with the release of the single New Found Glory announced a massive worldwide tour including UK shows for the end of the year as well as pre order details for their ninth studio album ‘Makes Me Sick’ an album which has finally just been released on Hopeless Records. After being addicted to ‘Happy Being Miserable’ for weeks after the single was released I had high expectations for the bands ninth studio album ‘Makes Me Sick’ and the album partly lives up to my expectations but not fully and that might be down to the fact that the bands previous album ‘Resurrection’ was pretty much faultless and a real tough one to follow up on. 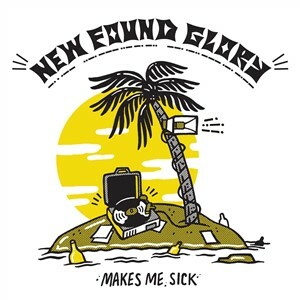 ‘Makes Me Sick’ is a 10 track album which runs for just over 30 minutes it’s as poppy as you would expect from a New Found Glory album and is full of summer anthems like you would also expect from a New Found Glory album and songs like ‘You’re Jokes Aren’t Funny’, ‘Party On Apocalypse’, ‘Call me Anti-Social’ and ‘Happy Being Miserable’ will be stuck in your head for days to come as each of these songs are pure pop-punk anthems especially ‘Party On Apocalypse’ for its seriously bouncy bassline opening and fast paced vocals from Jordan Pundik. However there are some seriously odd moments on the album such as ‘The Sound Of Two Voices’, the song sounds nothing like what New Found Glory have done before and sounds very odd on the album between all these amazing pop-punk anthems however oddly the song does have a summer vibe due to the tropical nature and sounds running through the song, on first listen I really wasn’t sure of the song but after a few more listens its started to grow on me. ‘Blurred Vision’ is a slower paced song about giving up on love and is slightly repetitive. ‘Say It Don’t Spray It’ is a big and bouncy number, ‘Barbed Wire’ easily has one of the most infectious choruses on the whole album, ‘Short And Sweet’ will having you singing “I don’t deserve someone as beautiful as you” along with Jordan Pundik. 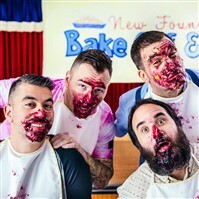 The album comes to a close with ‘The Cheapest Thrill’ a song which closes the album in an infectious pop-punk way likes you would expect from New Found Glory, full of bounce, epic instrumental work and fast paced vocals. Overall ‘Makes Me Sick’ see’s New Found Glory add another selection of summery pop-punk anthems to their set list however as an album there is something missing as ‘Makes Me Sick’ doesn’t have that lasting appeal as albums such as ‘Sticks And Stones’, ‘Catalyst’, ‘Coming Home’, ‘Resurrection’ did, however I am sure the album will make the sound track to many pop-punk fans summers.